Sunday morning I awoke at Lake Roberts, which was to be one of two "bases of operation" for the field work. Although field work would not start in earnest until Monday, Sunday was to be a day of training. 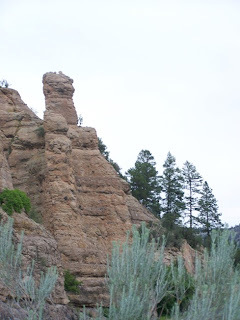 Most of the field crew worked on this project last summer, but this was my first time to New Mexico as a trained botanist (I had been when I was about 11, but did not really pay attention to the plants). Kelly, the head of the project, was leading a plant walk around Lake Roberts for the local chapter of the New Mexico Native Plant Society. So this was my opportunity to get start learning the local flora. Learning to recognize new plant species is one of my favorite learning experiences, especially when you have the help of an expert out in the field. Here is a picture of Lake Roberts. They have had problems with algae in the lake and there are these robotic mechanical "bees" which aerate the water in an attempt to reduce algal growth. You can see one towards the bottom of the picture. I did learn many new plants that day, but for many of them I was unable to get good photos. 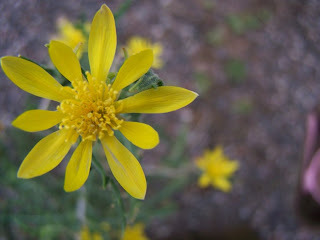 Here are a few of my favorite photos from the plant walk. The green gentian (Fraseria speciosa). Earlier I posted a close up photo of the flower. If I am remembering correctly, this plant stands about 4 feet tall. Despite having little color (other than green) it is a stunning plant. Lotus wrightii - a delicate plant with these amazing bi-colored flowers. 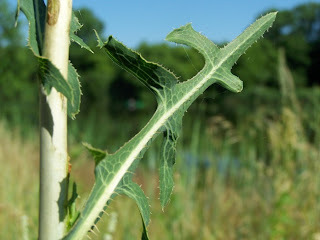 I was also able to get a cool picture of a common plant, that is very familiar to me (Lactuca serriola, prickly lettuce). I really like how well you can see the small spines on the leaves. I am embarrassed that don't remember the name of this plant species. But I really love the photos. We can just call it a DYC (darn yellow composite), composite referring to a plant family. 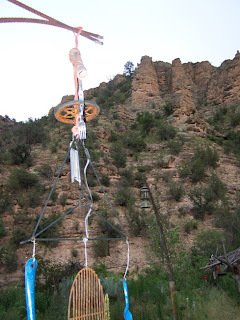 Later that evening we went to the Gila Hot Springs for a soak, a first for me. 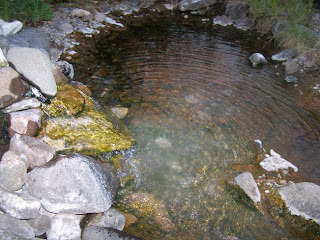 The hot springs themselves are natural, but the pools containing the hot water are completely man-made. 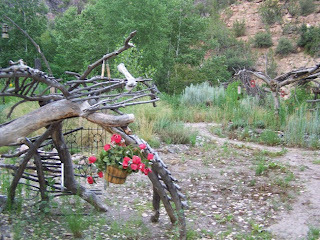 The experience of soaking in the springs was enhanced by the charming folk art scattered around the pools and the stunning rock cliffs along the river (not the mention the fabulous company). I did not get a picture of my favorite folk art piece, which was a bird cage with a model of a T-rex skeleton inside. Really funny, and I would like to duplicate it. 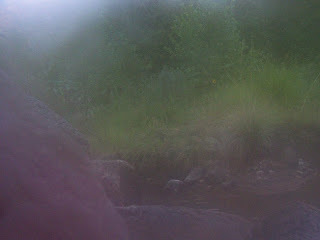 I also learned that getting up close to the hottest pool in the hot springs will fog up your camera (I know, common sense should have told me this, but sometimes I just have to learn by experience). 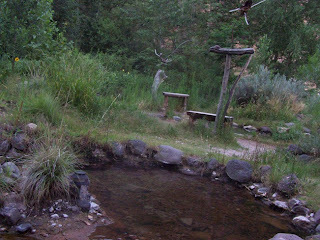 If you are in the area, I highly recommend these hot springs. It was a wonderful experience and I will definitely seek out hot springs in the future.